Mental Health Stigma - Challenging it together! Online lesson plans on Mental Health now available! Truth and Reconciliation, What is it about? 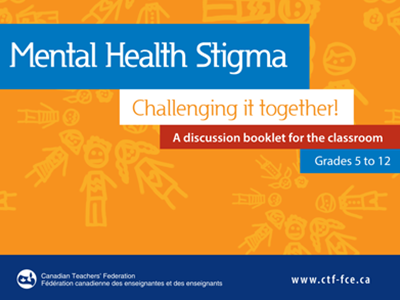 Mental Health Stigma - Challenging it together is a discussion booklet for students, by students, which includes a selection of statements, stories and drawings received from Canadian students in grades 5 to 12. The conception, development and production of this booklet represent the collaborative work of the members of the Canadian Teachers’ Federation’s Advisory Committee on Diversity and Human Rights of 2015-2016. We thank every student and teacher who participated in this important discussion and hope that this booklet will be a valuable resource for teachers in their work. It is a wonderful opportunity for students and teachers to challenge their biases and assumptions about mental health stigma in Canada and to reshape the discourse. Help build a community of empathetic youth by better understanding mental health and addressing stereotypes and stigma. Challenge your students to become the voice of mental health stigma at their school and access a $300 subsidy to offset awareness building project expenses. Teachers must be logged in to Imagineaction to access the resources. Lesson plans have been developed to support the use of this discussion booklet in the classroom. Teachers can access the lesson plans on the CTF Imagineaction program, under the Teacher Resources tab. Teachers must be logged in to Imagineaction to access the resources. For additional information, communicate with info@imagine-action.ca. To obtain printed copies at $3.00 each, please visit CTF Publications Catalogue.